Today Manoocher Samii came to visit for the afternoon, the sun managed to start shining through the clouds so we headed out to find a nice place for a walk… I got a bit lost driving through Tunbridge Wells and found myself miles from where I had intended to be, so we ended up visiting Bodiam Castle. Built in 1385, most of the interior of the castle has been destroyed but the exterior shell is still largely in tact and enough remains of the rooms and spiral staircases to make it a fun and throught provoking visit. Today it was quite quiet and thus very peaceful. 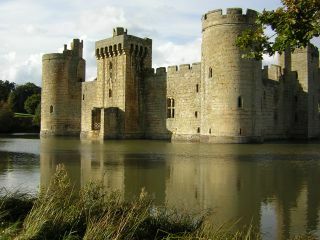 Although Bodiam was built as a defensive castle it was also used as a home and is beautifully surrounded by not only a complete moat but also many hills. It was a slightly rushed but certainly pleasant use of thirty minutes. Clicking on the photo above will lead you to more photos taken on our visit to the castle, or for more information you can visit the castle’s page on the National Trust’s website. Previous PostUK Two Pound CoinNext PostEssential Pollution? Excellent photographs! Very well framed and executed. I’m lucky enough to work in this castle and know it well. You have captured it’s beauty, tranquility and colour magnificently. The sandstone changes colour every minute of the day and can cross from being gentle, golden, comforting to imposing, stark, aggressive; just by a simple wash of cloud over the vineyards to the north. The best times for capuring on film are 1st thing on a misty morning (steam rising from the moat in February or on a hop-picking morning in early September) and just at the end of the day (this is where I am lucky – it’s closing time) – the dust is settling from the last few visitor’s footsteps; the sun, low in the West reflecting violent orange on the surface of the moat, cascading through the postern gatehouse window. Your photographs do the place justice … nice one!